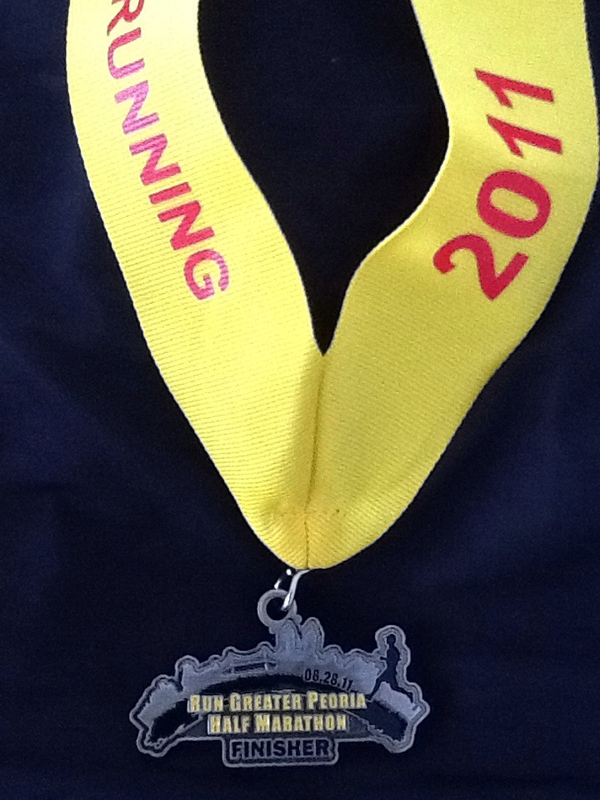 This morning Rob and I headed to Pekin to run the Run Greater Peoria Half Marathon. The course was originally supposed to be a scenic run of Peoria including crossing a bridge over the Illinois River. For some reason the course was moved to the neighboring town of Pekin. No matter to us, just meant making sure we made it to the right location. The temps were perfect, mild and calm. I had a bit of a hectic morning. First, my Garmin 210 didn’t charge and actually the battery was drained from not being set properly on the charging clip. Then my ORRT singlet wasn’t clean so I had to run in my ORRT sports bra. Rob was able to get me a car charger with usb so I was able to get my Garmin charged on the ride over. I had my standard coffee and Hammer Bar. I’m sorry it’s TMI, but also the majic happened so I was set up for a good race. The race was small, I suspect about 200-250 racers. 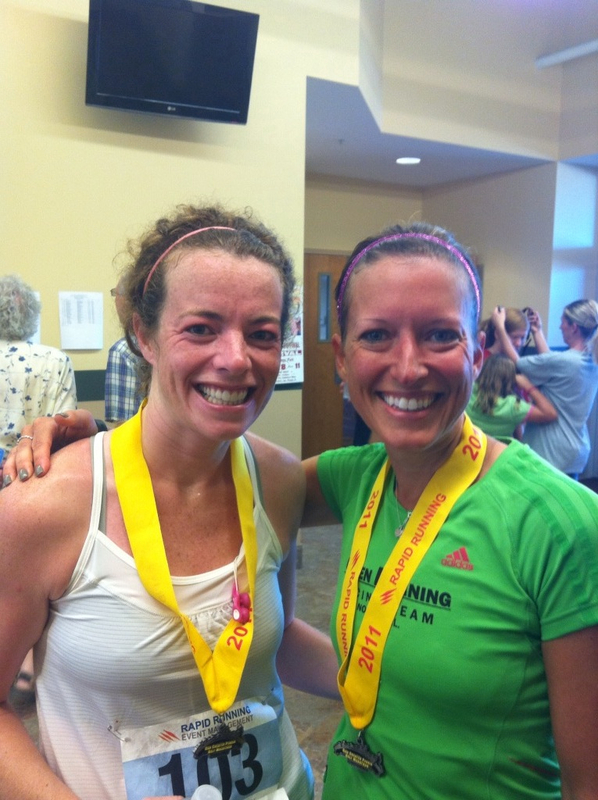 I ran into Jamie a fellow runner that I met at the Washington Cherry Festival 5K. Rob and I lined up to the front and we were off in no time. I was first female for not even a mile and a young woman comes bounding by effortlessly. I wonder if she can keep up the effort or if we will meet up later in the race. My paces were going perfectly. In fact I felt amazing, like I haven’t felt in ages. Another young female passes me around mile 4. I resist the urge to hold pace with her and choose to focus on my pace since it’s a possibility I could PR. She stays within my eye line, just .25 to .5 ahead at most. By mile 6 we are starting the hills. I knew we would have hills mid race, but I was surprised by the repeated amount of hills. 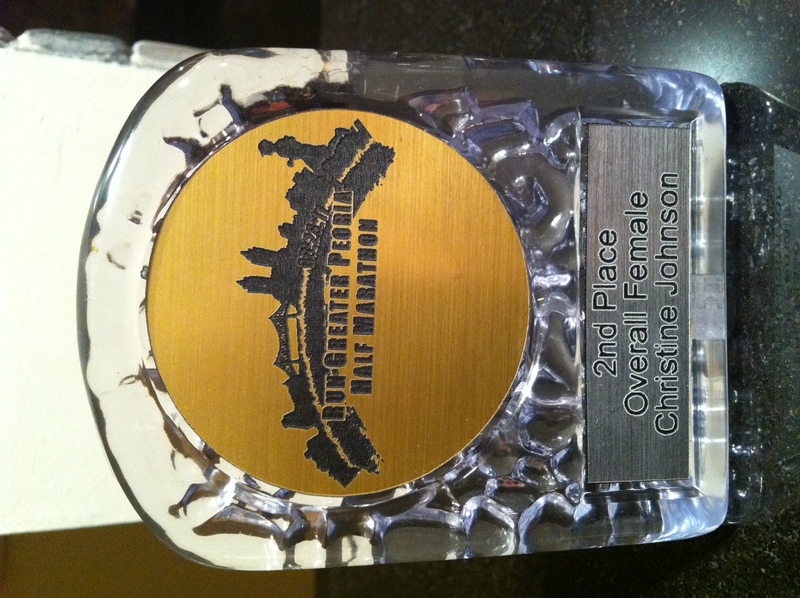 I am able to pass the second place female around mile 8. Seriously, when will these hills before. My pacing is slowed to MGP during this time, so much for a PR. By mile 11 it flatens out, but all I can do is focus on moving forward to get through the last miles. I run into Rob who is having ankle pain that has forced him to walk. He has been dealing with a nagging strain that is likely from spin class. He is walking and running through the pain to finish. 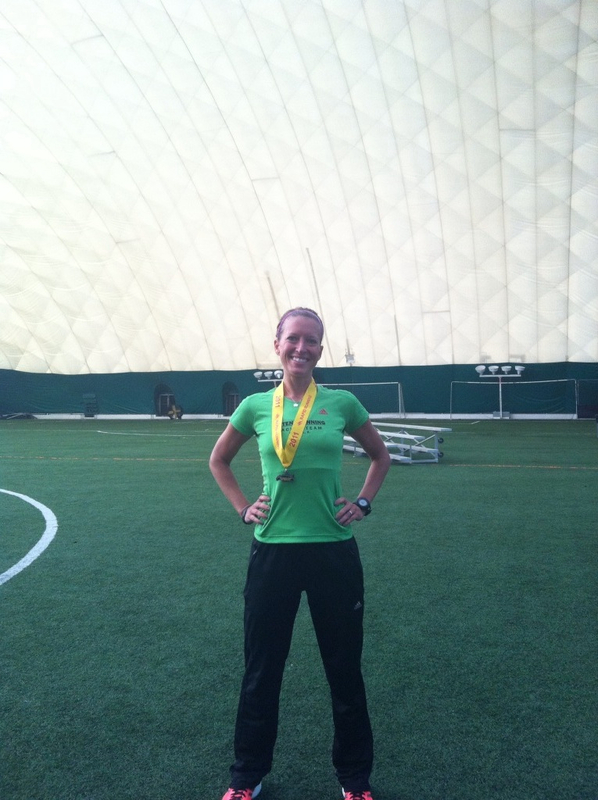 I’m able to hold off the now third place female and come across the line in second place over all with 1:37:04. I am over joyed to have finally had a race that my stomach didn’t hurt at all and I was able to run feeling back to normal. Rob shows up not long after at 1:38:15. We are happy to have raced, but Rob was ready to ice his foot. Jamie had a great race, she PRed even with the hills, which shows she is going to have an amazing time on a flat course. I was able to get her to take a picture with me. The post party was in an interesting dome arena type building. We found out awards would be mailed out in 2-4 weeks so we left to get Rob’s ankle iced. 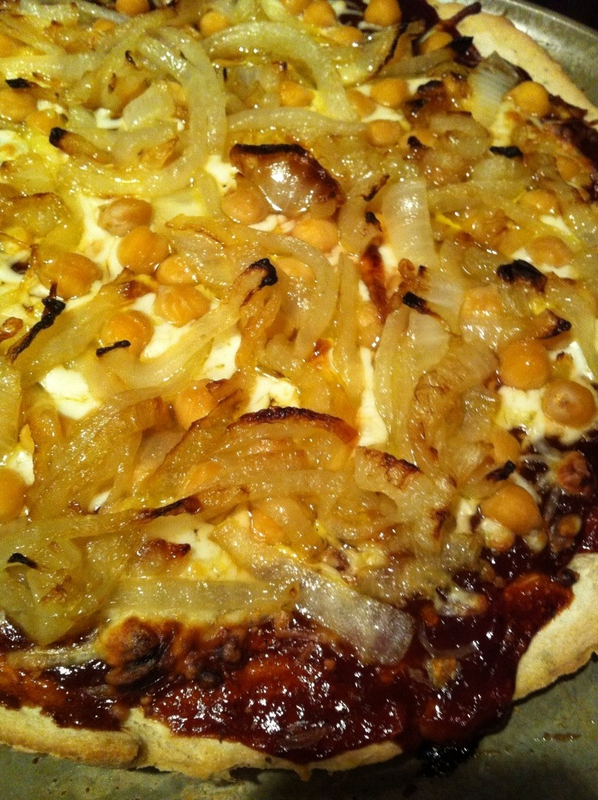 Later that evening I went to spin class and then came home to make Jenna’s BBQ Chickpea and Sauteed Onion Pizza with a gluten free crust. Afterward we hung out with our friends Chris and Lisa. 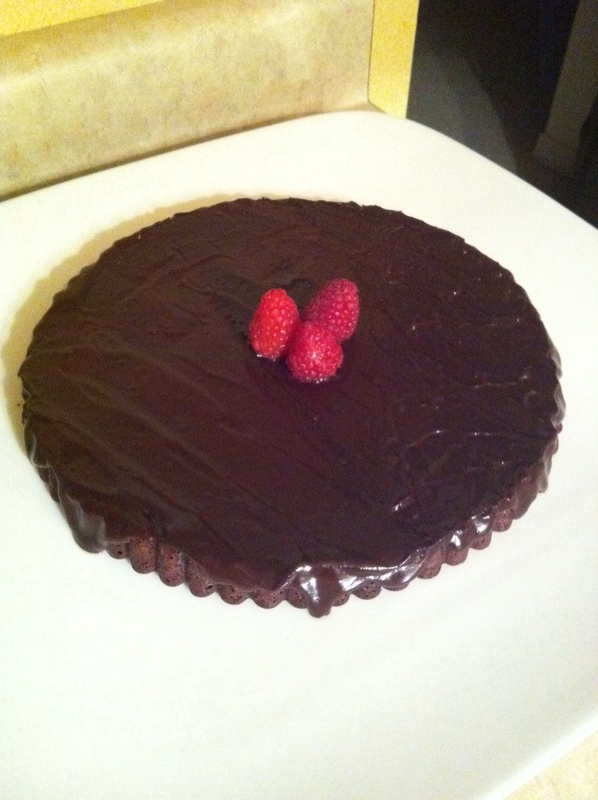 Lisa made me an amazing gluten free cake! It was to die for! Update: Four weeks later Rob and I each got our awards. Great race! I was impressed with the course, it was a lot of fun and pretty well organized for an inaugural race. Congratulations on 2nd Place female overall, impressive! I’m going to try to run today….praying that my knee cooperates! Wow great pace! I’m glad you had such good race. I immediately saw this and knew how happy you would be. Outstanding Job, and impressive time for a hilly course ..hooray!!! I just read through too many pages of your blog and I LOVE it! You’ve definitely inspired me to run many half marathons next year. I’m doing the Chicago Marathon as well (though you’ll finish WAY before me)! Glad to hear there were no tummy issues! Thanks Meghan! I’m so glad you like my blog and found it motivational. I love getting comments and reading other blogs too so please keep me posted on your progress!